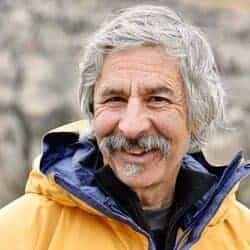 Jon Turk earned a Ph.D. in organic chemistry in 1971 and was nominated by National Geographic as one of the Top Ten Adventurers of the Year in 2012. Between these bookends, Jon wrote the first environmental science textbook in North America, while simultaneously pursuing extreme adventure: he has kayaked around Cape Horn and across the North Pacific, circumnavigated Ellesmere Island, and made first climbing ascents and ski descents on remote mountains all over the world. Between 1999 and 2005, Jon learned Koryak wisdom from Moolynaut, one of the last of the old time Siberian shamans. Jon has written four popular books on his adventures and the Conscious Revolution that will carry humanity into the 21st century with hope, sustainability, and compassion.